Four juveniles were arrested in a series of flash mob-style attacks on Temple University's campus this weekend that left students and police officers hurt, police and university officials said. Groups of young people, estimated to number between 20 to 100, roved the school's North Philadelphia campus Friday night for nearly two hours causing havoc, authorities said. Students were punched and kicked, an officer tossed to the ground and stones were thrown at passing cars, police said. Officers from three agencies — the Philadelphia Police Department, Temple University police and SEPTA police —responded to the incidents. As many as six Temple students were hurt in the attacks as they walked around campus between 8 p.m. and 9:30 p.m. that night, along with a university police officer and a Philadelphia police horse. One student, who was not identified, told the college news site The Tab she was walking with her boyfriend near 16th and Oxford streets around 8 p.m. when they were attacked by two kids. The student told the news site her boyfriend was able to run away but she was grabbed by the hair and beaten on her head and back. “I somehow got to the other side of Oxford Street by the time they got me to the ground. I remember shoes coming for my face and after that I heard other kids from the group saying ‘Yo chill, yo chill, it’s just a girl’ and they pulled my attackers off me," she reportedly said. Police said a 20-year-old man also fell victim to an attack by kids from this group. At 9 p.m., a Temple police officer was tossed to the ground, landing on top of her patrol bike, while trying to apprehend a 15-year-old boy who was seen throwing rocks at cars driving along Broad Street, police said. The teen was running from officers when he attacked the patrolwoman, police said. She suffered bruises to her leg and a scrape to her knee. The teen was apprehended a block away. About 10 minutes later, a 15-year-old teen walked up to an equine officer and punched the animal in the head and face at Broad Street and Cecil B. Moore Avenue, police said. The mounted officer had been dispatched to help disperse as many as 100 kids at that corner. He was arrested following a short chase. Another attack happened about 10 minutes after that, around 9:20 p.m., along the 1700 block of Cecil B. Moore Avenue. 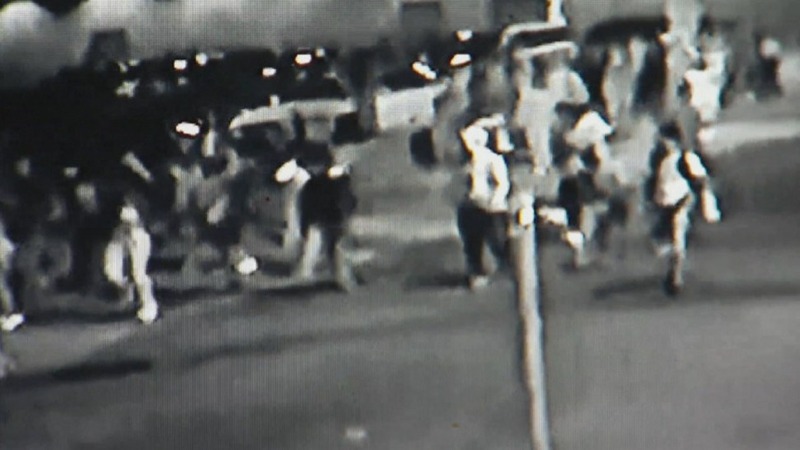 Three teens, an 18-year-old girl and two 19-year-old boys, were beaten down by as many as 30 young people, police said. The girl suffered scrapes and cuts to her legs. Her cellphone was smashed and debit card stolen. Between the boys, an iPhone, wallet, backpack and Bluetooth wireless speaker was taken, according to police. The suspects in this attack have not yet been arrested. In all, as many as 50 juveniles were taken into custody and four — ranging in age from 15 to 17 years old — were charged with crimes. The charges include aggravated assault, robbery and assaulting a police officer. Temple spokesman Ray Betzner said Friday the juveniles played a "cat-and-mouse game" with officers. A campus alert warning students and staff was sent around 9:30 p.m.
Joe Lauletta, the father of one of the apparent victims, posted an angry message to Facebook about his daughter's attack. He said the youth who attacked his daughter "held her down and kicked and stomped on her repeatedly," referring to the attackers as "sick animals." The attack landed her in the hospital, he added. NBC10 reached out to Lauletta for an interview. Lauletta said his daughter and two male friends were exiting the subway, coming home from the Temple football game when they were beaten. Philadelphia police, Temple police and the university are all investigating the incidents.